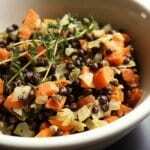 Warm Lentil Salad | JPMA, Inc. The garlic and dijon mustard give this salad a zesty flavor that you'll love. Heat oil over medium heat in a saute pan/skillet. Add carrots, onion and a pinch of salt and pepper. Cook until soft, 5-8 minutes. Add garlic and herbs (optional), cook for one minute. If using vinegar, red wine, white wine or cider vinegar work best. If available, chopped leek can be substituted for onion.